On the advice of my friend, Laura, I bought an Oster bread maker about a year ago. I’ve made exactly one loaf of bread, and it was lovely. Unfortunately, it did not come with a bread slicing fairy, so I lost interest quickly. Laura had told me she used her bread maker to make jellies and jams, though, so when I started eyeing with distress my 8lbs of plums from Bountiful Baskets, I decided it was time to haul it out from under the sink and get down to business. Basically, you throw a cup of sugar, a tablespoon of powdered pectin, two teaspoons of lemon juice, and a cup and a half of the fruit of your choice into the bread maker pan. You let it mix for 5 minutes, then you set it to bake for an hour. Et voila, jam! You pour that into heated jars, pop on the lids, then process them in hot water until the jar lids sea. Then let the jars cool before putting them in the fridge to set the jam. 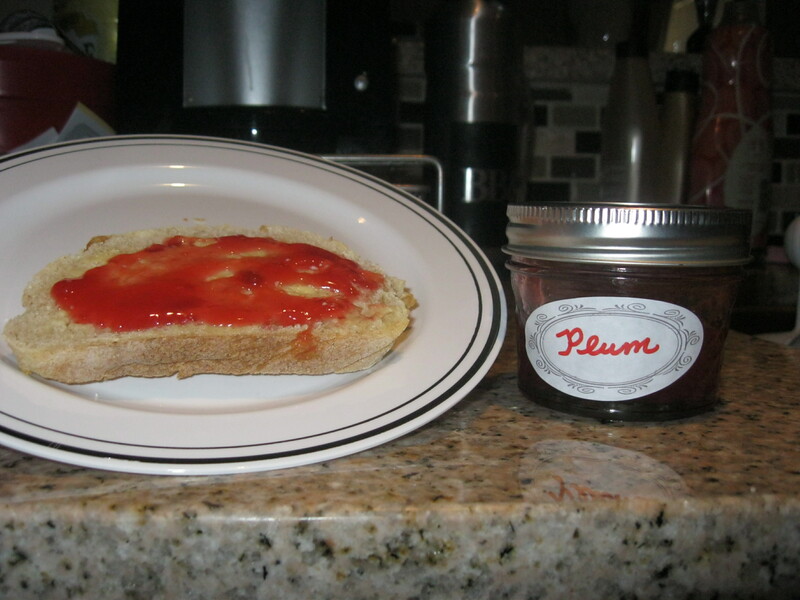 I made both plum and strawberry jam last night. Thor and I ate the plum jam for breakfast, on toasted sourdough bread from Bountiful Baskets, with my favorite butter, Kerrygold–an Irish butter. Thor ate both his pieces without a word, but tells me now that it would have been perfect, had I not let the butter and jam mix together. Plum jam on toasted sourdough. Mmmm.